Would you explain what appears to be a conflict in the way we interpret the Scriptures? Jesus frequently encountered sinful people whom he “forgave” with no mention of repentance. For example, he said to a crippled man, “Son, be of good cheer, your sins are forgiven” (Mt. 9:2). There is no mention of repentance. First, it must be recognized that virtually no single passage contains the full complement of information that may be associated with a biblical theme. A failure to recognize this is a common fallacy committed by both secular and sectarian writers in a variety of issues. For example, skeptics will select a text which mentions a judgment from God inflicted upon a disobedient rebel (e.g., Num. 15:32ff) and then generalize that the Lord must be a harsh, hateful being. In this procedure, they neglect the scores of passages that reveal the love and mercy of the Creator and his acts of benevolence, along with reasons for those divine judgments of which the skeptic is critical. Similarly, the faith-only advocate will single out texts that mention only one component of the plan of salvation (e.g., faith; Jn. 3:16; Rom. 5:1) and conclude that salvation is by faith alone, wholly ignoring other complimentary passages (e.g., Acts 2:38). This is an egregious interpretive flaw. [the] general harmony of fundamental doctrine which pervades the entire Scriptures. It assumes that the Bible is a self-interpreting book, and what is obscure in one passage may be illuminated by another. No single statement or obscure passage of one book can be allowed to set aside a doctrine which is clearly established by many passages. The obscure texts must be interpreted in the light of those which are plain and positive (Terry 1890, 449; see also Fairbairn 1859, 122ff). This is an undisputed principle of interpretation in scholarly works, though frequently ignored by novices or those pursuing a prized agenda. In the matter of forgiveness, there are various texts in the Gospel narratives which mention Jesus extending forgiveness without any attending explicit mention of repentance. For example, the incident regarding one of the thieves crucified next to Christ contains the necessary implication of forgiveness (Lk. 23:43), yet there was no extraction from the robber of a confession that his thievery was sinful. One must conclude, however, that the Lord recognized his penitence, else there would have been no promise of Paradise later that day. It must not be assumed that the absence of any mention of repentance sanctioned the man’s thievery or nullified the necessity of a penitent disposition. 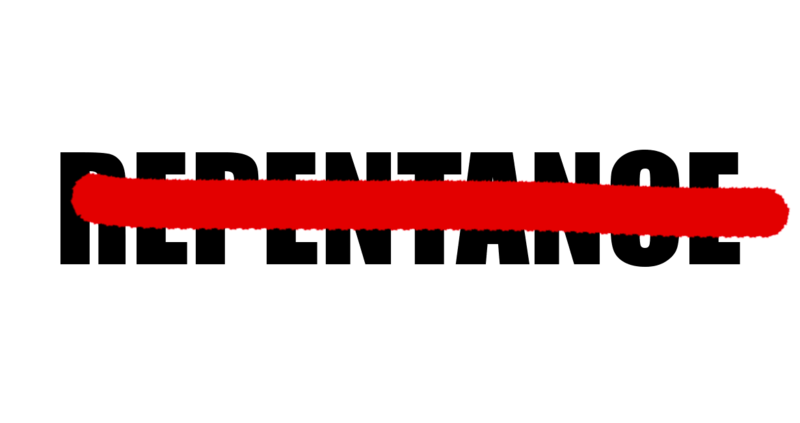 It cannot be argued, therefore, that because repentance was not explicitly mentioned in connection with some cases where Christ pronounced pardon that repentance is not required for the reception of forgiveness. What shall we say of passages that mention baptism but do not mention faith (e.g., Acts 22:16 and 1 Pet. 3:21)? Does this nullify faith as a condition of salvation? What about a text that mentions repentance but does not mention either faith or baptism (e.g., Acts 11:18; Rom. 2:4)? Are the latter two automatically eliminated from the plan of redemption? Of course not. One must take the sum of truth on a particular Bible topic (Psa. 119:160) — not some of the truth. The analogy-of-faith principle is frequently acknowledged by competent Bible scholars, even if they sometimes fail to make the application in areas that conflict with some cherished theological position. In multiple texts that address the same general theme, one passage may supplement another, but a more abbreviated text may not nullify information in the other passage that contains more information. Remember this: Scripture may supplement itself. It never contradicts itself. Why Does Romans 10:9-10 Not Mention Baptism? Fairbairn, Patrick. 1859. Hermeneutical Manual. Philadelphia, PA: Smith, English & Co.
Terry, Milton. 1890. Biblical Hermeneutics. New York, NY: Eaton & Mains.